Now that Ramadan is over, the case of Kartika Sari Dewi Shukarno is back in the news. As you know, Ramadan is the Muslim holy month during which followers abstain during daylight hours from things like eating, drinking, smoking, and (in Malaysia) beating women with sticks for having a glass of beer. Kartika, who was sentenced earlier this year to six lashes for the latter offense, got a reprieve in August that officials said was due to the start of the holy month and not at all because of embarrassing media reports about their willingness to beat up a girl. They may have hoped that the sentence would be overturned on appeal, sparing them further embarrassment. If so, nope. Reports on September 28 said that an appellate court had affirmed the sentence, saying it was now up to the religious authorities to carry it out. Those authorities have argued that this would be only a light punishment with the thinnest of canes, as opposed to the far more serious punishments that are carried out with larger sticks and on bare flesh. (This graphic is sort of comical, but the injuries from those punishments are actually pretty horrific.) But civil-rights activists have insisted that even a "gentle caning" (whatever that means) would be unfair and would hurt Malaysia's image. 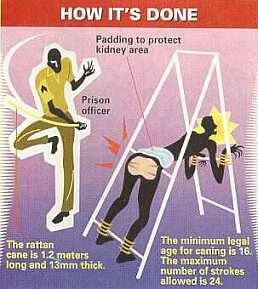 The civil authorities are now satisfied, at least, that the Prisons Department has the "knowledge and expertise" necessary to carry out the caning. They had actually expressed some concern about the department's ability to do that, but after a demonstration in early September by a female prison official, a government minister said the beating could proceed. "She tapped the back of a chair with the cane," said the minister about the expert demonstration. "I am now satisfied that the caning can be carried out by the department if the court decides to proceed and enforce the sentence." Good work, minister, and congratulations to everyone involved. Kartika, who pleaded guilty and has consistently asked that they get it over with, may be seeing a silver lining in all this. On September 25, she was quoted as saying that she had been approached by a producer about the possibility of starring in a movie based on her ordeal. She said it was too soon to decide whether she would accept. "It is too far ahead," she told The Star. "I can't think of anything beyond my punishment at the moment." She may have mixed emotions about it at this point. On the one hand, she must be relieved to hear about the tapping of the chair and the minister's report that "little force was involved," suggesting that this will only be a token punishment if it's carried out at all. On the other hand, the lighter the caning, the more boring the movie.